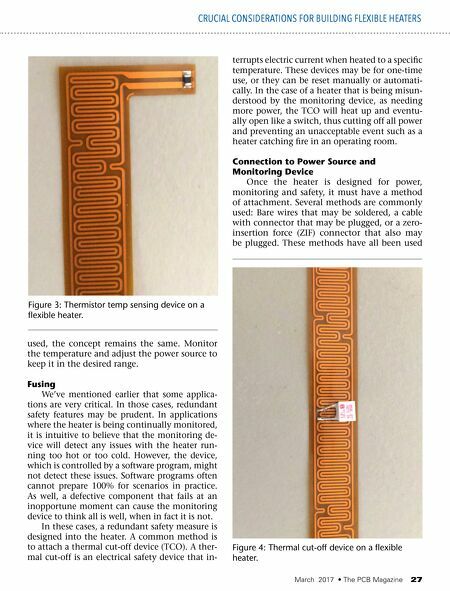 26 The PCB Magazine • March 2017 CRUCIAL CONSIDERATIONS FOR BUILDING FLEXIBLE HEATERS 4. What temperature the material should be during the process 5. The power source available 6. Whether the heater will be monitored and how it will be monitored Armed with this information, an engineer can confidently design a heater that will fit the application and heat it to the prescribed temperature in the specified time range con- sistently. Conductor Options Conductor choice is important to a flexible heater design. The most cost-effective choice is standard copper, which is available on pre-laminated material and used extensively worldwide in flexible circuits. However, a heat - er designed with copper requires a lot of sur- face area because of its low resistivity of 669.29 x 10 -9 /in², thus it is typically used for very low resistive designs. Heaters that are designed for small areas with high heat requirements are typically designed with some type of nickel/ copper alloy such as Inconel or Constantan. They have resistivity levels of 40.55 x 10 -6 /in² and 19.29 x 10 -6 /in², respectively and allow for higher resistive circuits in much smaller areas. Nickel/copper alloys are not widely available pre-laminated on polyimide and therefore are less cost effective because the processes and material costs are higher. However, heaters de - signed with these conductors are just as robust as standard copper and perform very well in all applications. A key specification is the target temperature of the material being heated. Once the required temperature is known, it can be converted to watts/in² and Ohm's Law may be used to calculate the proper resistance required for the heater. 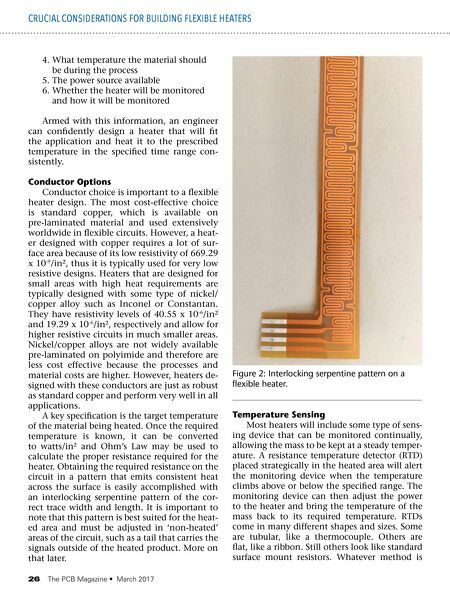 Obtaining the required resistance on the circuit in a pattern that emits consistent heat across the surface is easily accomplished with an interlocking serpentine pattern of the cor- rect trace width and length. It is important to note that this pattern is best suited for the heat- ed area and must be adjusted in 'non-heated' areas of the circuit, such as a tail that carries the signals outside of the heated product. More on that later. Temperature Sensing Most heaters will include some type of sens- ing device that can be monitored continually, allowing the mass to be kept at a steady temper- ature. A resistance temperature detector (RTD) placed strategically in the heated area will alert the monitoring device when the temperature climbs above or below the specified range. The monitoring device can then adjust the power to the heater and bring the temperature of the mass back to its required temperature. RTDs come in many different shapes and sizes. Some are tubular, like a thermocouple. Others are flat, like a ribbon. Still others look like standard surface mount resistors. Whatever method is Figure 2: Interlocking serpentine pattern on a flexible heater.